Shodo Artist Sora will perfom with her Big Brush and give audience Power and Energy! 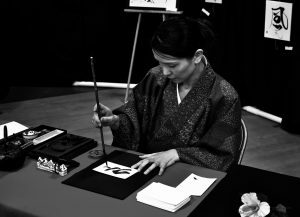 Sora will perform ”SHODO" with Musicians with her Big Brush. Sora will write names, favorite words, or the words she feels from the Aura of people upon request. Experience performance brush and papers. Express your feeling on big paper!